Let me start by thanking all of you for your kind words and support in regard to my Halloween tribute to Crissy. Your response was really overwhelming and I'm so thankful to have an encouraging online family like y'all. It meant more to me than you know. Thank you. Now, I stayed so busy making my meal plan and getting photos of the recipe below that I just didn't get a chance to share either of them with y'all yesterday. I'm not going to let all that hard work go to waste. 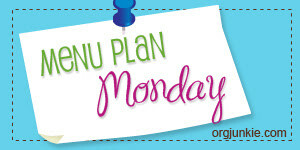 I'm going to try to link this up to Menu Plan Monday at I'm an Organizing Junkie, but since it is Tuesday....we'll see. Spicy honey roasted chicken: This was really easy to make and was quite tasty. I will admit that I don't eat the skin and that's where all the spicy honey flavor was so I didn't really get any of that. I may make this again. Easy blueberry muffins: These were really delish and LOADED with blueberries. I think I want to try them with wheat flour next time, but otherwise they were great! Wild mushroom pattitsio: This was really kind of blah. I read all the reviews and a few said the same thing, but I didn't believe them as all the ingredients sounded yummy. It wasn't BAD per se, it was just bland and boring without much flavor. I thought I fixed that with some white wine and additional garlic and ground mustard, but nope. Bland as all get out. I'm pretty sure I won't make this again. Beef with snow peas: I have made this recipe several times before. It is always quite yummy and will definitely be made again. I absolutely love avocados, but since the hubby isn't fond of them I don't include them in a lot of meal plans. I do tend to add them to the side of some dishes if possible though. However, they often ripen before I remember I have them. When that happens, I make this yummy veggie dip. It's pretty much a version of this Greek Yogurt dip recipe but with more avocado, less yogurt, and onions added. It comes together pretty quickly. I like to make it in a plastic container to keep the mess down as well as to go ahead and stash it in the fridge. I know there aren't any exact measurements, I just tweak it according to my taste and what I have on hand. In this case; I used 2 avocados, 3 grape tomatoes, 1/4 an onion, and 1/5 a cucumber. 1- Dice the avocado(s) in their shells and scoop the meat out. 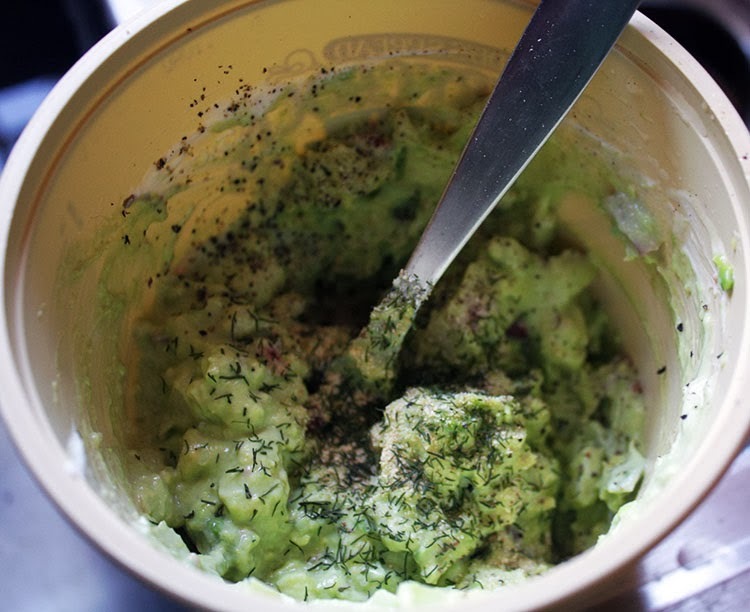 Then, mash the avocado. 2- Dice the other veggies fairly small and add them to the bowl. 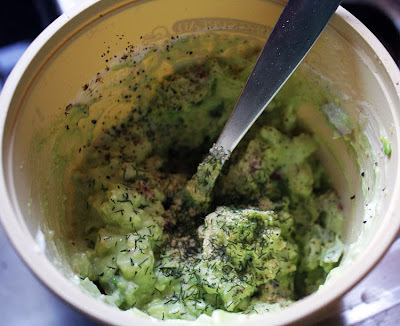 3- Squeeze in some lime juice (this just keeps the avocado from browning and looking nasty). 4- Add yogurt (I probably added about 1/3 to 1/2 a cup) and mix. Add more until you get your desired consistently. 5- Add salt, pepper, garlic, and dill to taste. 6- Store in fridge for at least 30 minutes to let flavors meld, though eating it right away isn't unheard of. 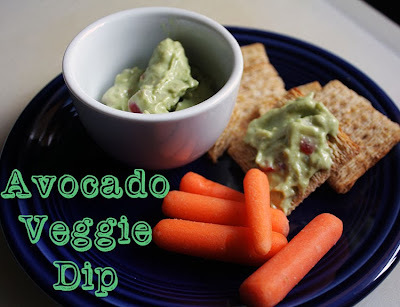 I like this dip on wheat crackers or other veggies, though I could probably just eat it by the spoonful. 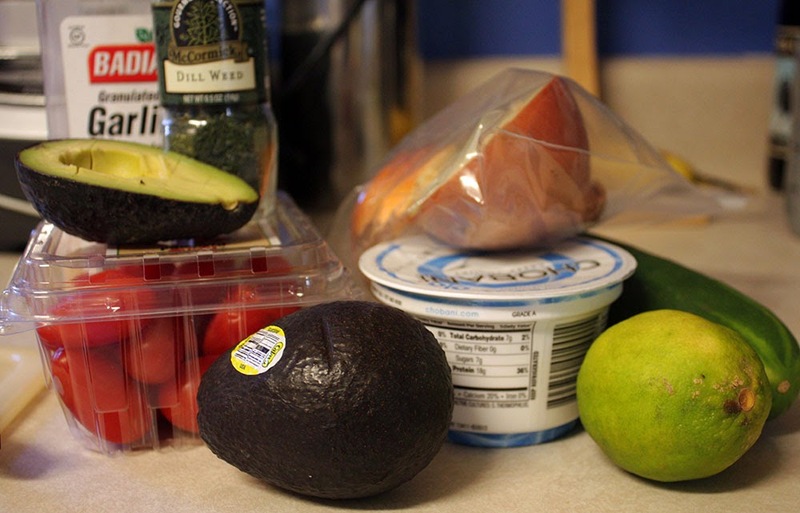 I will be happy to take any avocado leftovers, Hope :) ... I always used lemon juice to prevent browning but I bet lime juice is much tastier! I'm going to have to make that Chicken Caprese dish and the beef with snow peas. Thanks for sharing!! !